Earlier today, OnePlus confirmed that the OnePlus 5, its next flagship smartphone, would be officially announced in two weeks' time - on June 20. If you just can't wait until June 20 to discover the OnePlus 5, it seems that we can take a brief look at the handset as of now. 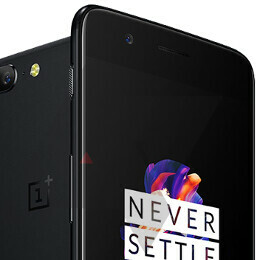 According to Android Police, the device that we're seeing below is the OnePlus 5. The handset appears to be fairly thin, and, as anticipated, it has a dual camera on the back. Apparently, there's very little bezel on the left and right sides of the phone's screen, but the top bezel might seem huge to some folks. If this is indeed the OnePlus 5, it certainly resembles the Oppo R11, a 5.5-inch smartphone announced this week in China. You see, both Oppo and OnePlus are a sub-brands of China-based BBK Electronics, so it's not exactly surprising for some of their handsets to have common design elements. may not remember, but the original OnePlus One (released in 2014) bared a strong resemblance to Oppo's Find 7a - this being said, we're not going to be shocked if, come June 20, the OnePlus 5 will be unveiled as an Oppo R11 lookalike. We're including some official renders of the Oppo R11 below, so you can check out what's to be expected from the OnePlus 5. You'll probably notice that the R11 kind of looks like an iPhone 7 Plus from certain angles. Will we be saying the same thing about the OnePlus 5? Well, we'll just have to wait until June 20 to find out. The Oppo R11 features a dual rear camera with 2x optical zoom and selective focus, and we're obviously expecting the OnePlus 5 to have a similar camera (albeit enhanced by DxO). While the Oppo R11 is a mid-range handset based on a Snapdragon 660 processor, we know for certain that the OnePlus 5 will be a high-end powerhouse thanks to Qualcomm's Snapdragon 835 processor (which is also powering flagships like the Samsung Galaxy S8 and HTC U11). P. S.: In case you're wondering, the difference between Oppo and OnePlus is that the latter sells its phones in more countries around the world, including the US, and positions itself as a global brand that releases just one important product yearly, whereas Oppo launches multiple handset models each year, and markets them mainly in Asia and some European countries. Hmm. That camera layout and bump looks eerily familiar. They don't need reputation, they just need sales. BUT OPPO IS NO WHERE NEAR THE BEST. It is the best or second best seller in China. However I think diggie meant iPhone not Oppo. Oppo and OnePlus owned by the same company. Btw, the bezels at the top from the leaked images looks so huge which is contrary to the fact that oneplus says that this phone is smaller than the op3. Well maybe they downgraded the screen size to achieve that. I hope that this is not the production unit. It looks just like an iPhone 7 plus in Matt Black. And those bezels !! I don't want the bezels to be S8 thin but come on ! It's almost as if this thing called personal preference exists, and different people have different tastes. I do agree that they should be slimmer, but still. Bezels aren't disgusting anymore you Troll.. Bezels are very useful and attractive. Just look at the awkward S8 design. That is disgusting because there it looks like a widened glass ruler and so hard to be hand help properly. So Yes, Bezels are so nice and must be preserved in the future too. Ohh man, I just fee that my 7 Plus looks so dated compared to S8+ of my colluegue who sits next to me. Do you like anything made by Samsung? Considering the OPO was 95% the same as the Oppo 7a and they are owned by the same company it's not hard to believe. Also those bezels are woeful. If I wanted Samsung, I'd wait for a decent deal. If I wanted an iPhone, I'd just save up and buy one. I patiently waited for OnePlus because I wanted an aluminum body, but if it's gonna be an iClone I'm just gonna wait until I see some axon 8 leaks or a sale on the Galaxy S8 that flirts with the $500 price point. CopyCat 5 shall be the name instead..!